PORTLAND — The past two years, nothing has been able to stop Gaven Jolley in his quest to win a state championship. This year, something finally did. No, it wasn't an opponent. It was a ruling, a technicality. 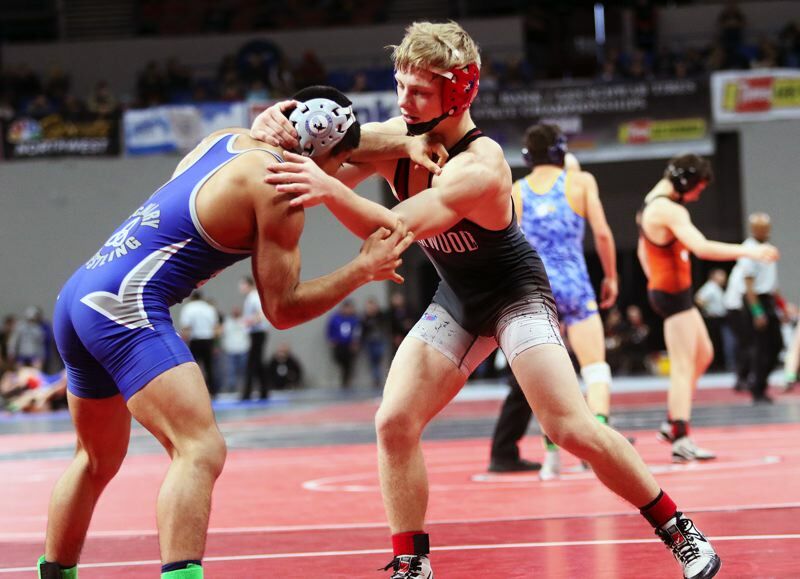 Jolley, a Sherwood High School junior, saw his attempt to win a third straight Class 6A wrestling state championship end with a disqualification loss in his semifinal bout at the 2018 state tournament, held Friday and Saturday at Veterans Memorial Coliseum. "For sure, it was unfortunate," Jolley said at the tournament. 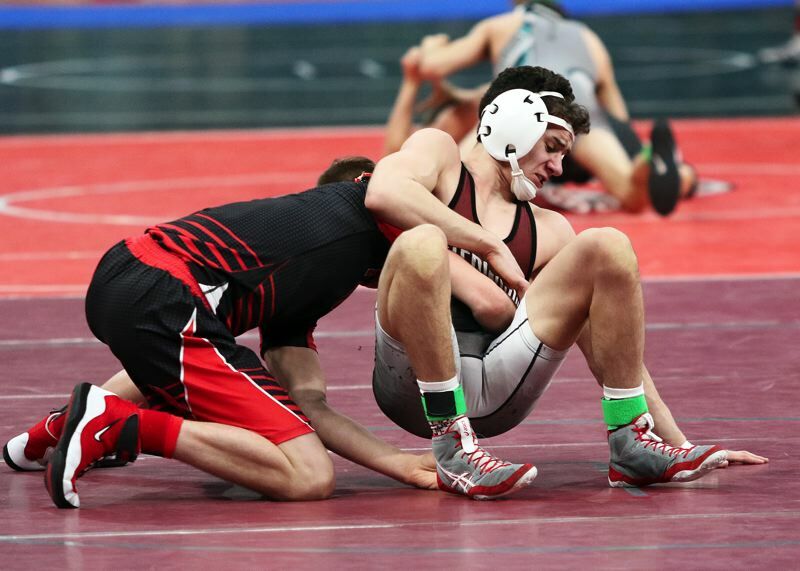 Still, Jolley came back from the disqualification to win his final two matches, earning him the third-place medal in the 126-pound weight class, leading the way for the Bowmen squad, which had qualified nine wrestlers for the state tournament. "We had the most guys go to state in school history," said Sherwood senior Rustin Williams, who finished in sixth place in the 182-pound weight division. "It's pretty exciting. It's been a great year. We just had great team bonding and good team chemistry. We all loved each other and we pushed everybody in the wrestling room." Jolley, who won a Class 6A state title at 113 pounds as a freshman, and then claimed state gold at 120 as a sophomore, took a 22-1 record into the state tournament, which his only loss, an 11-7 decision setback coming against Camas, Wash., standout Jack Latimer back on Dec. 2. It was discovered the following day after the loss that Jolley was suffering from an appendicitis. Jolley, the No. 1 seed at 126 pounds, got off to a roaring start to the state tournament. He started off by pinning Lincoln's Finn Lawless in a time of 1 minute and 47 seconds in a first-round match. In the second round, Jolley defeated Centennial's Tui Laithang by fall in 3:22. Jolley then picked up another pin in the quarterfinals, beating Glencoe's A.J. Lucas in 1:32. In the semifinals, against No. 5 seed Thomas Spence of Roseburg, Jolley scored on a quick takedown to take a 2-0 lead. Spence then got an escape, to cut the lead to 2-1. Jolley, going for another takedown of Spence, was whistled for an illegal slam. It was then determined by tournament trainers that Spence, who was showing concussion-like symptoms following the move, was unable to continue. That, according to Sherwood coach Jeff Wilson, led to the automatic disqualification of Jolley, due to the illegal slam which caused the injury, 37 seconds into the bout. "So, I went into the semifinals, and I got the first takedown, and my opponent went to stand up and I returned him, and they called it a slam," Jolley said. "So I ended up losing the match because of that." That left Jolley disappointed, but it also left him determined to come back strong. 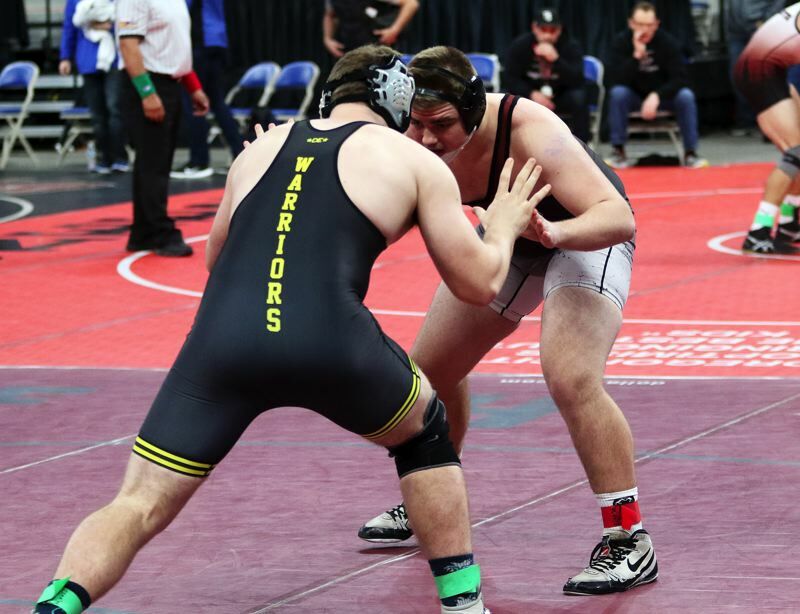 In his first match following the disqualification, Jolley posted a 21-7 major-decision win over Southridge's Devon Martin in the consolation semifinals. In the third-place match, against No. 3 seed Enrique Vincent of McNary, Jolley took a 2-0 lead after coming up with a takedown with 1:38 remaining in the first round. Vincent countered with an escape, but Jolley responded with another takedown, coming with 0:10 left in the period, to take a 4-1 lead into the second round. Vincent got the only score in that period, coming on as escape, cutting Jolley's lead to 4-2 going into the third round. But Jolley opened the final period with an escape of his own, and then he got a takedown with 1:09 left in the period, taking a 7-2 lead on his way to getting a 7-3 decision victory — and third place in the 126-pound weight class. "I came back and got third. It was important to me to win those last two matches," Jolley said. "A lot of people have been congratulating me. Because that's not something that is easy to do — keeping your head up." Jolley finished the season with a final record of 27-2. "After my appendicitis, I came back and I haven't been taken down since. I'm pretty proud about that," he said. "I'm going to be very motivated next year. This summer, I'll have nationals, and I'll be training hard. I'm excited." 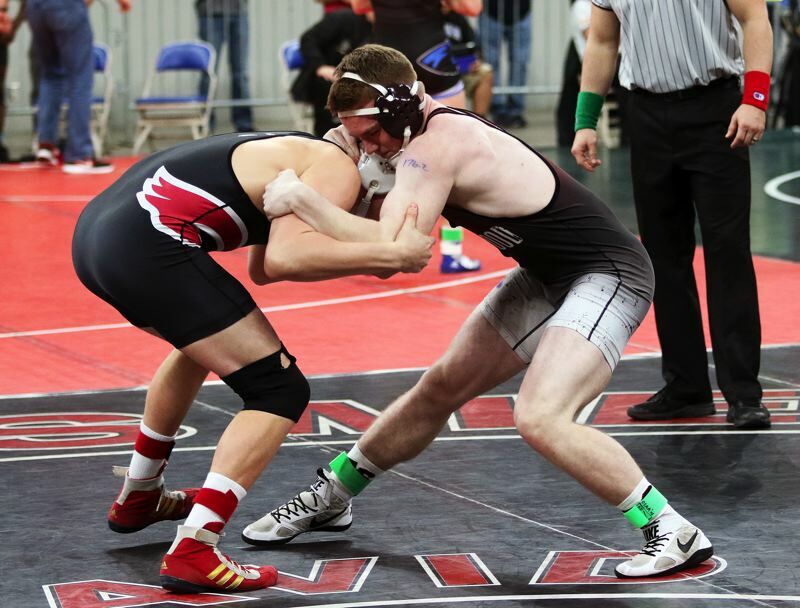 Williams, after receiving a first-round bye, lost his first match, a 3-2 decision setback against Lincoln's William Duffy in a second-round match. That meant that Williams had a long road ahead of him if he was to earn a spot on the award stand. But he was up to the challenge, winning four straight matches in the consolation bracket, before losing his last two, putting him in sixth place. "It means a lot," Williams said of earning a spot on the podium. "Last year, when I came into this tournament, I went 1-2. So, this year, I came in more determined. I lost my first match, so I was facing adversity. Scratching and clawing my way back up to the state placing. It's a great feeling." 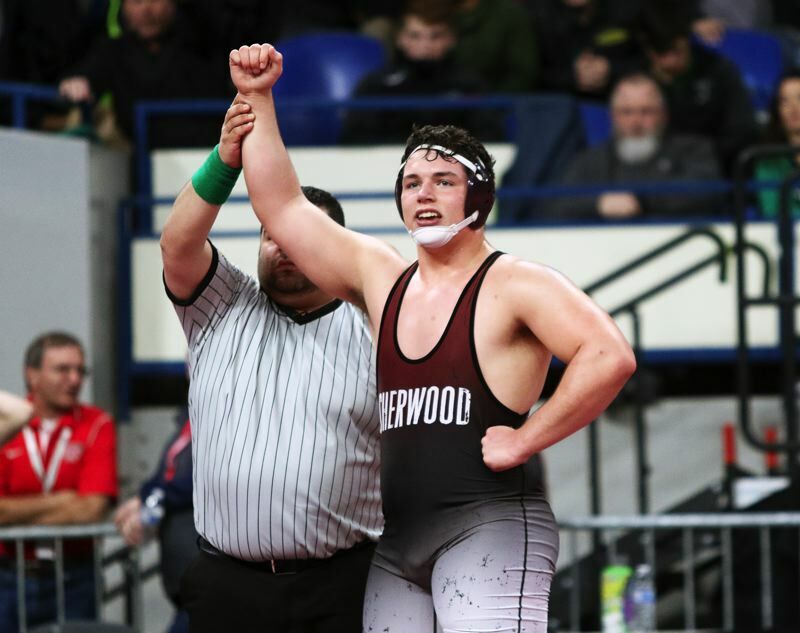 Sherwood senior Jayden Cuthbertson also found success at the state tournament, winning three of his five matches at 285 pounds, and coming one victory away from placing. "This feels real good," Cuthbertson said after pinning Roosevelt's Sergio Gonzalez in a first-round tournament match. "I'm glad I got a first-round win. I'm really motivated to keep going." Sherwood junior Jackson Barton, at 220 pounds, won two of his four matches at the state tournament. Sophomore Philip Resch, at 132, also picked up a tourney victory. Also wrestling for Sherwood at the state tournament were junior Logan Swanson (113 pounds), freshman Dallen Jolley (120), senior Jack Murphy (126) and sophomore Brody Stevens (138). Sherwood finished in 18th place in the team standings at the state tournament with 46 points. Roseburg won the Class 6A state team title with a score of 252.